Posh skipper Chris Forrester in action at Scunthorpe. Photo: Joe Dent/theposh.com. 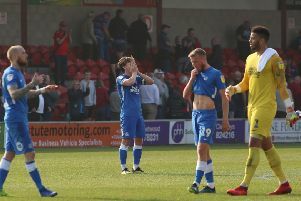 Peterborough United manager Grant McCann insists his side were well worth a point from their trip to high-flying Scunthorpe United today (January 2). An own goal six minutes from time by Scunthorpe defender Charlie Goode delivered a third 1-1 draw of the festive programme for Posh after a tough clash at Glanford Park. The Posh management team of Grant McCann (right) and Lee Glover before the game at Scunthorpe. Photo: Joe Dent/theposh.com. Josh Morris had shot the home side in front in the final minute of the first-half direct from a free kick. The draw extended Posh’s unbeaten run in all competitions to seven matches ahead of an FA Cup third round tie at Chelsea on Sunday (January 8). They have, however, dropped to eighth in League One. Scunthorpe remain third. McCann gave a debut to new striker Junior Morias and included on-loan midfielder Martin Samuelsen from the start, at the start of his second loan spell at Posh. Posh midfielder Martin Samuelsen takes on a group of Scunthorpe defenders. Photo: Joe Dent/theposh.com. McCann said: “It’s a good point against a very good side and we deserved it. “Scunthorpe were better than us in the first half, but we shaded the second half. “I tried a new system in the first-half and it didn’t really work as we hadn’t had long enough to work on it. “The idea was for Martin Samuelsen and Paul Taylor to drift in and around Junior Morias, but we gave the ball away too cheaply. “The substitutions we made at half-time helped us. We went with two wide men in Samuelsen and Marcus Maddison and they caused Scunthorpe problems. “We came here to win the game, but we’ll take the point. The lads dug in as they have all season. “They did okay in the first-half until giving away a stupid free kick on the stroke of half-time. Josh Morris is a threat from that sort of situation and he scored a great goal. “I felt Junior did well on his debut. He’s a strong, aggressive lad who is ready to play at this level. “We defended well again, but I have to say Chris Forrester gave one of the most complete midfield displays I’ve seen in a long time. “He controlled the game from the start. “Three points from nine is obviously not ideal, but we have lost just one of our last 13 matches so we are in good form. McCann revealed a new centre-back could sign for Posh in the next couple of days.